Devon and Cornwall are wild and exciting parts of Britain. When the first monks came to Britain they probably came by sea up the Severn. They seem to have favoured Wales first, but soon they were on the move, some perhaps to Ireland others to the north shores of Devon and Cornwall. The heart of East Cornwall is glorious Bodmin Moor. But we must start on the northern coast. 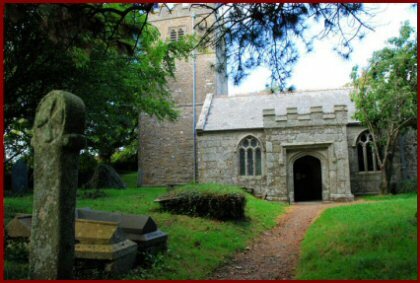 Over Exmoor is Chittlehampton where St Iwerydd from Wales (or Heiritha in Latin, Urith in English) lived as a virgin. She was decapitated either by the scythes of local jealous women, or Saxons, or Vikings. 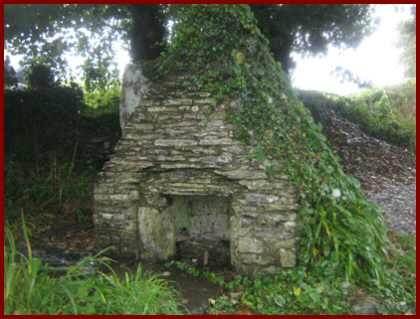 We know already from St Elenud of Slwch Tump that where the head stops rolling, up springs a holy well. 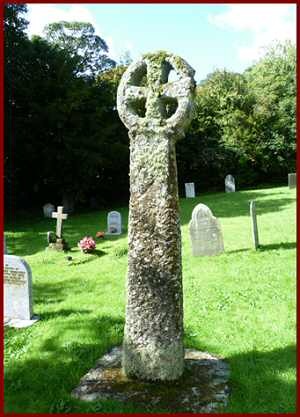 St Sidwell in Exeter (also scythed) and St Juthwara (Aud Wyry) in Dorset are other examples. 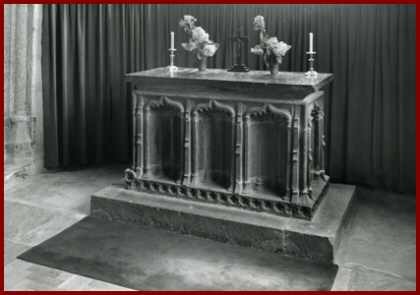 In St Urith’s case we still have her grave where her shrine was in the church. The church has the biggest tower in Devon, built as a result of the pilgrims that came to venerate her. St Brannoc (6C), also from Wales. He made his cell at Braunton (Brannockstood) on the Taw/Torridge estuary near Barnstaple and may have built the very first church in Devon. He may be buried under the high altar. 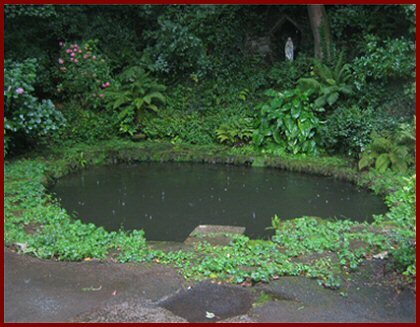 His holy well is a very pleasant fine round pool. Nectan (6C) also probably came from Wales, being reputedly the son of Brychan, king of Brecknock. At Stoke just inside Devon, thieves cut off the hermit’s head. He picked up his head and walked with it till he fell and there sprung up a holy well. 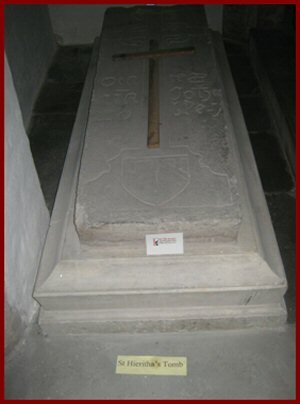 He was buried in what is an impressive church close to the sea. The monks of Hartland abbey walked several times a day to his shrine for worship and prayer. His holy well lies down a dark and leafy glade. The northern coast has many a place for a hermit to dwell. 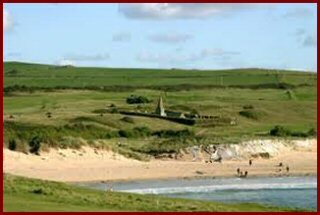 St Gennys, which takes its name from a 6C saint, is just inside Cornwall situated high on cliffs with superb views over the sea. There is one holy well behind the church, another at the front. 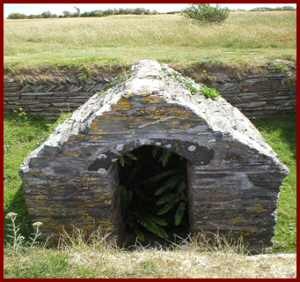 St Piran (or Peran, Perran) is said to have come from Ireland in 6C and landed further south. 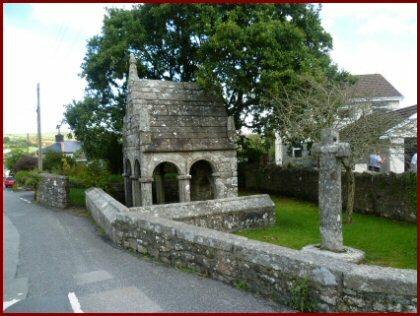 But he also has a well by Boscastle. 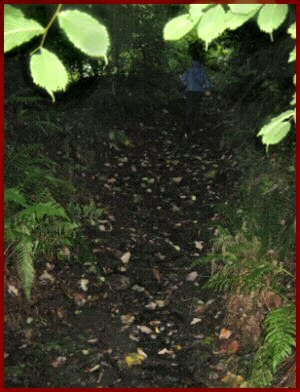 By St Piran’s well a path leads up through a narrow wooded valley typical of Cornwall where St Nectan had another cell. Up the valley a very secluded 60 foot waterfall has over centuries carved for itself several bowls out of the rock. It has then broken through the side of each in turn to start yet another bowl. 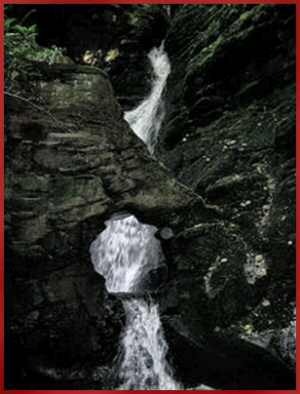 The place is also called St Nechtan’s Kieve, the word kieve meaning ‘bowl’ in Cornish. It is an amazing spot and has attracted many stories. It is a popular place for visitors to leave mementoes. 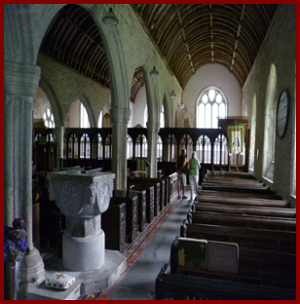 St Juliot’s Church, near Boscastle, is in another hidden valley. She too may have come from Wales. There is an early circular enclosure around the church with 3 of its original boundary crosses intact and in place. Everybody has heard of Tintagel. This is another very dramatic spot, a rocky headland almost cut off by the sea. It was once thought to be the earliest monastery in Britain; but it is more likely an off-shore trading post in Roman and post Roman times. Legend makes it the birthplace of King Arthur. Several female saints lived round here. St Materiana and St Endellientia may also have come from Wales. St Endellentia’s shrine is now used as an altar at St Endellion. Nearby, on the eastern shore of the Camel Estuary, is the church of St Gwinnodock, a 6C hermit, whose name is now abbreviated to Enedoc. He put his oratory close to the sea for a spot of easy fishing and access to wherever he wanted by boat. He wasn’t to know that in time the sand would cover the later church; so much so that once upon a time the only way to attend service was to enter by a hole in the roof. The spire also twisted due to warping roof timbers. Eventually it had to be dug out. St Kew, has the distinction of being the earliest named monastery in Cornwall. It was first called ‘Lan Docco’, or the ‘church of Docco’, who came from Wales. In the 7C, the ‘Life of St Samson’ recounts how St Samson, on his way from Wales to Brittany, called on the monastery but was not allowed in. He was known to be a fervent man and the monks did not live to his standards! 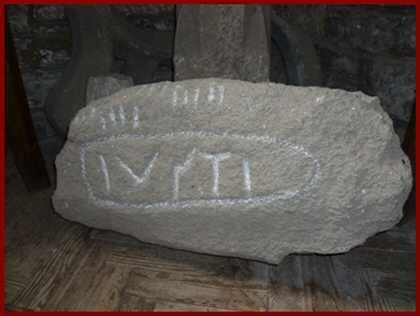 A remarkable bilingual stone in Latin and Ogham, has survived. It was used as a ‘pillow’ placed at the head of the grave on which the name of the deceased was written, in this case ‘Justus’. Round here ancient churches are many. St Tudy, St Minver, St Mabyn, St Teath, St Breoc, St Breward (Branwallader), and St Advenna (Advent) all came from Wales, though some went on to Brittany and the Channel Islands. Most of these churches have magnificent square towers which dominate the landscape. Judging by their size, they served many pilgrims. At Davidstowe (church of St David) the water of the holy well is so pure it is used for local cheese-making. Bodmin Moor provides the villages with copious pure water. St Clether was begun by another monk from Wales. 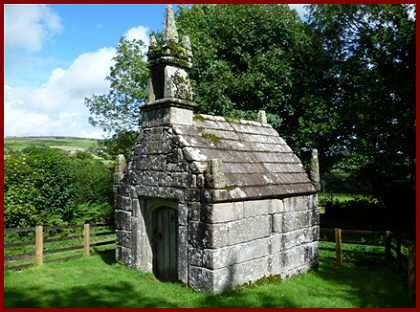 A short walk up the Moor takes us to the most complete well chapel and holy well in Cornwall. 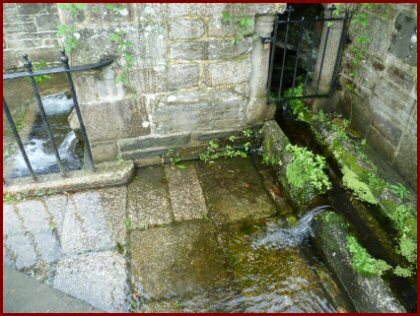 The water runs from the well into the church, under the altar, and out again into a pool where pilgrims collected their water. The presence of the relics in the altar were deemed to increase the efficacy of the water. The altar is over 1000 years old. The well at Laneast – the ‘Lan’ (monastery/church/village in the east – dedicated to St Sidwell has a ‘Jordan’ well indicating its use for baptisms. It also has a fine Cornish cross. Altarnon, ‘altar of Non’, is dedicated to St: David’s mother. This well was once famous for curing the insane but is now an overgrown green pool. The church – the ’Cathedral of the Moor ’ – is stunning with 3 screens and 3 altars stretching right across the church. The flow of Welsh pilgrims here must have been very great. 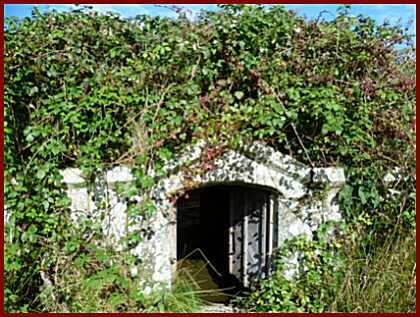 Further east and south round the Moor is the most ornate wellhouse of all, at Dupath near Callington. Going round back west of the Moor is St Cleer (St Clederus?). Here is another fine wellhouse/baptistry where, like Altarnon, the insane were ‘bowssened’ in cold water, in a manner of ‘shock’ therapy. Nearby, the remains of two crosses commemorate the last king of Cornwall, King Doniert (Duncan), who died in AD 875. Further west still is St Neots (St Anietus?) and St Meubred’s at Cardinham. Both with fine crosses and churches. St Petroc is one of the two great saints of Cornwall. 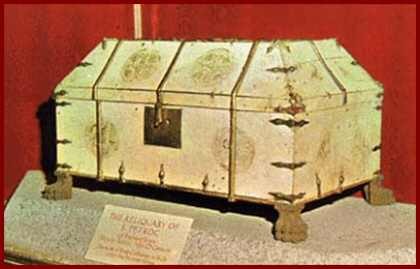 Bodmin has had his relics since the Danes attacked Cornwall in 981. His well is in the nearby park, now partially submerged. Coming from Wales, he founded monasteries at Padstow (Petrocstowe) and Little Petherick on the Camel estuary. 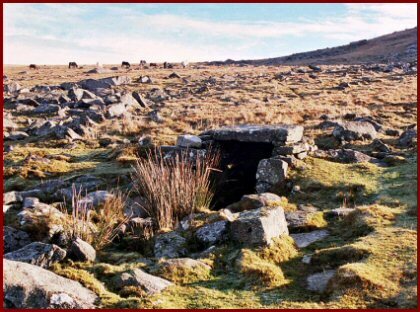 He is said to have spent time on the Moor as a hermit in his later days. 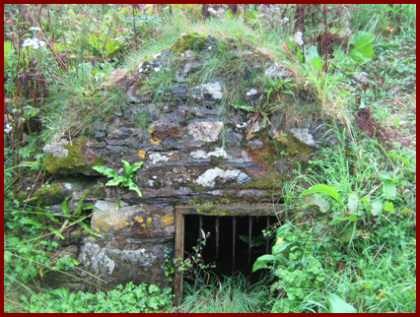 A hermit called Guron lived at Bodmin before him. He has a well outside St Petroc’s church flowing right on the street. A very old statue was found in St Petroc’s well 100 years ago. It had been put there to hide it from the men of Oliver Cromwell. It suffered remarkably little damage and can now be seen’ all cleaned up and looking smart with a new coat of paint in St Mary’s Church. Perhaps this is another little parable of the survival and endurance of the Tradition. Eastern Cornwall reminds us much of the Desert Fathers. Everywhere we find hermits, men and women living in wild places, in cliffs, in rocks, by the sea or on moors. When we make the effort to see where they lived, we understand that though the way of holiness according to the tradition is tough it nevertheless yields the fruit of sanctity. Cornwall is a dramatic landscape of moor and rock, of sand and sea, of sun and wind and rain. Here before raw creation, humanity seems so tiny, and utterly dependant. 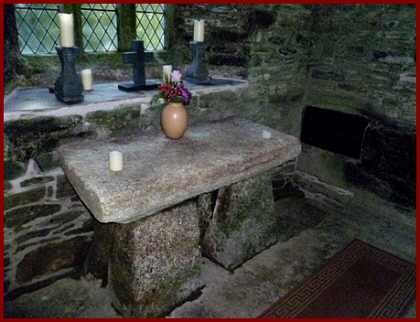 In Cornwall they blessed the ancient wells and sacred places. Later, many grave-stones and crosses sprung up. They marked the landscape for ever. Copyright © The Orthodox Parish of Sts Bega, Mungo, and Herbert, Keswick, Cumbria.